A NOOSE-controlled Annihilator scouting for the player in GTA IV once they obtain a five or six star wanted level. The Annihilator, sometimes known as the NOOSE Annihilator, is an armed attack helicopter in Grand Theft Auto IV and Grand Theft Auto Online (based on the UH-60 Blackhawk) used by the Department Of Aviation. The Annihilator's design and real-life counterpart are comparable to those of the Raindance in Grand Theft Auto: San Andreas. It fills the attack helicopter role previously taken by the GTA III-era Hunter. Operated by the LC Patriotism and Immigration Authority, or NOOSE, the Annihilator is one of the two armed law enforcement vehicles (The other being the APC) in GTA IV. It is occasionally seen patrolling the skies above Liberty City in single player mode, often over the East Borough Bridge and Hickey Bridge. Its livery is modeled after the US Custom and Border Protection's Office of CBP Air and Marine colors. The helicopter moves faster than any other vehicle in GTA IV, but is more difficult to slow down as a result. An effective way to slow down is to stop accelerating, pull back, and accelerate once again with the L-stick still held back, as opposed to simply reversing. The Annihilator is armed with four side-mounted miniguns, which are difficult to aim and require reloading after prolonged fire, but which are hugely devastating to people and vehicles alike, and are essentially supplied with infinite ammunition. 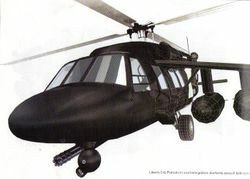 Also, many people use the rotors as weapons as they will kill people who get caught in them and fling vehicles, along with chopping off parts of other helicopters, such as the tail. Normally, AI-controlled Annihilators never use their miniguns, instead relying on NOOSE soldiers seated on the rounds to fire on the player. A passenger in an Annihilator (or any other helicopter) can shoot an assault rife type weapon whether they are in the large passenger bay in the center of the chopper, or in the copilot's seat, however this is VERY difficult, as the helicopter's speed and lack of steadiness will not aid in the accuracy of the weapon. Also, when a pistol or submachine gun is fired from a helicopter (particularly the Annihilator), it will usually not have the range to hit the target. The only weapons that can truly duke it out with the Annihilator are Rocket Launchers, assault rifles, or other Annihilators. The Buzzard and the explosive shotgun in The Ballad of Gay Tony can also be used to effectively engage an Annihilator. The RPG can destroy the Annihilator, or blast its tail off, forcing it to spin out of control. Annihilators facing their counterparts can do the same, or they can shoot off the rotor, also causing a crash. M4 or AK users have the range and stopping power to potentially kill pilots and/or passengers. Patient snipers may also be able to pluck a pilot out of the sky with a headshot. The Annihilator is a popular vehicle in GTA IV's multiplayer modes because of its speed, maneuverability and resistance to enemy fire. Entering the Annihilator in multiplayer automatically grants the player an RPG with 8 rounds. Two of the Annihilator's miniguns, GTA IV. The Annihilator's miniguns in action, GTA IV. The Annihilator is extensively available in several multiplayer modes in GTA IV. The Annihilator in GTA Online. In The Lost and Damned, the Annihilator's weapon is upgraded with explosive shells, and the top speed is increased, albeit not very noticeably. The minigun rounds can destroy vehicles and enemy players with only a few shots. When the explosive rounds, speed, and damage resistance are all put together, this equates to an extremely deadly vehicle, especially when facing an experienced pilot. The Annihilator is not made available in single-player mode, so it can only be acquired through the use of cheats or by sniping an Annihilator pilot flying low enough that the helicopter won't explode upon crashing. The Annihilator remains available in multiplayer's deathmatch and team deathmatch, and is an integral part of Chopper Vs Chopper. In The Ballad of Gay Tony, the helicopter remains the same as TLAD's revision, but this time it is available in single player, occasionally spawning on the MeTV building or the LCPD station in Lower Easton. NOOSE may now employ the helicopter's miniguns, but without explosive rounds, to assault the player during the missions "High Dive", "Not So Fast", and "For the Man Who Has Everything". The Annihilator is also removed from Team Deathmatch and Deathmatch, just as Annihilators were removed from TLAD's Free Mode. When compared to Buzzard, the Annihilator is not as useful, as the Buzzard is equipped with a rapid-fire machine gun along with missiles. However, the Annihilator is faster and can hold four people while the Buzzard only holds two. Early pre-release render of the Annihilator in GTA IV, with an all-black body. On a helipad in Francis International Airport, there is an Annihilator with explosive miniguns. However, this is only in The Ballad of Gay Tony. In Deathmatch, if you kill someone with rapid-firing weapon, the death message may appear as "Player annihilated Player". Its possible to get this message with Annihilator's miniguns, but it's random. The helicopter, like all other helicopters in the game, can lose its main rotor or tail boom, causing it to either hurtle towards the ground or spin wildly out of control. Also, though very rare, the tail rotor may shatter from continued damage, causing the chopper to spin out of control. Although the Annihilator has four M134 7.62 NATO miniguns, each has an unrealistically low rate of fire (ROF). The ROF of all four guns firing is slightly slower than that of an SMG; in real life, each of these should fire at least 70 rounds per second, with the helicopter's total ROF being 280 to 400 rounds per second with all miniguns firing. However, when heard from a third-person view, it sounds as if the miniguns are firing much, much faster. Along with the Fire Truck (and APC in The Ballad of Gay Tony) the Annihilator is one of the few vehicles in the game to have mounted weapons. The Annihilator is the only law enforcement vehicle that have access to radio programs. It is possible to use the Annihilator to gain the One Man Army Achievement/Trophy in Grand Theft Auto IV. First, the player has to obtain a six star wanted level, which can be easily done by shooting down civillians and destroying vehicles with the Annihilator's miniguns. Once the player has obtained a six star wanted level, the player is to fly as high as they can, but at the same time staying inside the search radius. The player only needs to hover there for five minutes, and the player should obtain the achievement. If any Police Mavericks and/or Annihilators come during the period, the player can just shoot them down with the Annihilator's miniguns. However, the player must make sure that they DO NOT spawn the Annihilator with cheats, or else it blocks the achievement/trophy, as well as the "Walk Free" Achievement/Trophy. One on a helipad at Northeast police station in Algonquin. It is watched over by LCPD officers armed with rifles, but stealing it will only attract the usual one star for vehicle theft, which can easily be evaded with the chopper. Niko needs to enter a doorway on the ground level and head up several flights (he might at one point come across a group of cops examining a dead body en route). Strangely, the guards are still present in TLAD even though the helicopter is no longer parked there. One in Purgatory near the Golden Pier. Taking this will attract no Wanted rating, since no one is guarding it. It can also be found in multiplayer. One on a helipad at the police headquarters in Lower Easton, Liberty City. Can be accessed by parking a large van/truck under a vent on the north side of the building,then jumping up a series of vents and edges to the top. One in Francis International Airport in single player. Taking this will attract a 4 star wanted level, as the Annihilator is in the FIA runway area. An Annihilator spawns on top of the MeTV building in Algonquin in place of a Maverick after the player shoots all 200 pigeons. Spawn by dialing 359-555-0100 using the phone. This disables the Walk Free and One Man Army achievements/trophies. At the Helitours heliport in multiplayer in GTA IV only. In Francis International Airport during multiplayer, three in GTA IV and one in The Ballad of Gay Tony. One on top of the fire station in south-west Alderney in multiplayer. On top of the police station on the west side of the parking building at the Francis International Airport in multiplayer. On top of a building in The Exchange in TBOGT multiplayer. The building is easy to spot from the air because it has a helipad on top. On top of a building in Castle Gardens in TBOGT multiplayer. The building is easy to spot from the air because it has a helipad on top. Hunter, an attack helicopter from GTA Vice City to Vice City Stories. Raindance, a helicopter from Grand Theft Auto: San Andreas based on the same real-life helicopter. This page was last modified on 15 December 2014, at 03:54.